The 1956 AFC Asian Cup was the first AFC Asian Cup, held every four years and organised by the Asian Football Confederation (AFC). The final tournament was held in Hong Kong from 1 September to 15 September 1956. It was won by South Korea. The 1960 AFC Asian Cup was the 2nd edition of the men's AFC Asian Cup, a quadrennial international football tournament organised by the Asian Football Confederation (AFC). The finals were hosted by South Korea from 14 October to 23 October 1960. The final tournament was organised on a round robin basis, and host country South Korea won with a perfect record of three wins. The 1972 AFC Asian Cup was the 5th edition of the men's AFC Asian Cup, a quadrennial international football tournament organised by the Asian Football Confederation (AFC). The finals were held in Thailand between 7 May and 19 May 1972. It was won by Iran. The 1984 AFC Asian Cup was the 8th edition of the men's AFC Asian Cup, a quadrennial international football tournament organised by the Asian Football Confederation (AFC). The finals were hosted by Singapore between 1 December and 16 December 1984. The field of ten teams was split into two groups of five. Saudi Arabia won their first title, beating China in the final 2–0. The 1988 AFC Asian Cup was the 9th edition of the men's AFC Asian Cup, a quadrennial international football tournament organised by the Asian Football Confederation (AFC). The finals were held in Qatar between 2 December and 18 December 1988. Saudi Arabia defeated Republic of Korea in the final match in Doha. The 1992 AFC Asian Cup was the 10th edition of the men's AFC Asian Cup, a quadrennial international football tournament organised by the Asian Football Confederation (AFC). The finals were held in Hiroshima Prefecture, Japan between 29 October and 8 November 1992. The host nation, Japan, defeated the defending champion Saudi Arabia in the final in Hiroshima. 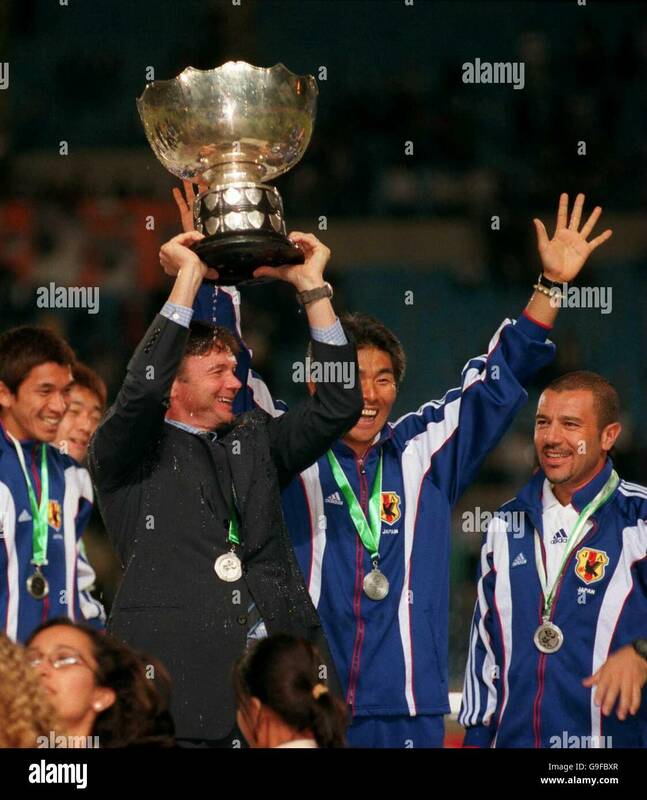 This was the first Asian Cup not to have any debuting countries. The 1996 AFC Asian Cup was the 11th edition of the men's AFC Asian Cup, a quadrennial international football tournament organised by the Asian Football Confederation (AFC). The finals were held in the United Arab Emirates between 4 and 21 December 1996. Saudi Arabia defeated hosts United Arab Emirates in the final match in Abu Dhabi. As the runners-up, the United Arab Emirates represented the AFC in the 1997 FIFA Confederations Cup as the winners Saudi Arabia had qualified automatically as host. The 2000 AFC Asian Cup was the 12th edition of the men's AFC Asian Cup, a quadrennial international football tournament organised by the Asian Football Confederation (AFC). The finals were held in Lebanon between 12 and 29 October 2000. Japan defeated defending champion Saudi Arabia in the final match in Beirut. The 2004 AFC Asian Cup was the 13th edition of the men's AFC Asian Cup, a quadrennial international football tournament organised by the Asian Football Confederation (AFC). It was held from 17 July to 7 August 2004 in China. The defending champions Japan defeated China in the final in Beijing. The tournament was marked by Saudi Arabia's unexpected failure to even make it out of the first round; a surprisingly good performance by Bahrain, which finished in fourth place; Jordan, which reached the quarterfinals in its first appearance and Indonesia, which gained their historical first Asian Cup win against Qatar. The final match between China and Japan was marked by post-match rioting by Chinese fans near the north gate of Beijing Workers' Stadium, in part due to controversial officiating and anti-Japanese sentiment resulting from historical tensions. The 2007 AFC Asian Cup was the 14th edition of the men's AFC Asian Cup, a quadrennial international football tournament organised by the Asian Football Confederation (AFC). The finals were held from 7 to 29 July 2007. For the first time in its history, the competition was co-hosted by four nations: Indonesia, Malaysia, Thailand and Vietnam. For the first time in the nation's history, Iraq won the continental title after it defeated Saudi Arabia 1–0 in the final. As the winner, Iraq represented the AFC in the 2009 FIFA Confederations Cup. Before 2007 and every four years, Asia often held its continental tournament from 1956 until China in 2004. With the Summer Olympic Games and the European Football Championship also held in the same year as the Asian Cup, the AFC changed their tradition. Beginning in 2007, Asia will hold its continental tournament a year earlier, and every four years henceforth from that date. An estimated worldwide television audience of 650 million people tuned in to watch the 2007 AFC Asian Cup.Australia participated for the first time since moving to the AFC from the OFC. Australia happened to also be the tournament's first nation aside from the co-hosts to qualify for the 2007 Asian Cup. The 2011 AFC Asian Cup was the 15th edition of the men's AFC Asian Cup, a quadrennial international football tournament organised by the Asian Football Confederation (AFC). The finals were held in Qatar from 7 to 29 January 2011. It was the fifteenth time the tournament has been held, and the second time it has been hosted by Qatar, the other being the 1988 AFC Asian Cup. Japan won the cup after a 1–0 win against Australia, and earned the right to compete in the 2013 FIFA Confederations Cup in Brazil as the representative from AFC.A television viewing audience of 484 million in 80 countries across the Asia-Pacific region, Europe, North America and North Africa witnessed Japan defeat Australia 1–0 in the final. The winner of the 2010 AFC Challenge Cup: Korea DPR. The 2015 AFC Asian Cup qualification was a qualification process organized by the AFC to determine the participating teams for the 2015 AFC Asian Cup. The 2015 AFC Asian Cup, hosted by Australia, featured 16 teams. Winners of the 2014 AFC Challenge Cup (Palestine)As the host nation Australia also finished as runners-up in the 2011 AFC Asian Cup, the initial 6 automatic qualification spots were reduced to 5, with a total of 11 spots eventually determined by the qualification matches, in which 20 AFC members compete. The 2019 AFC Asian Cup was the 17th edition of the AFC Asian Cup, the quadrennial international men's football championship of Asia organised by the Asian Football Confederation (AFC). It was held in the United Arab Emirates from 5 January to 1 February 2019.For the first time, the Asian Cup final tournament was contested by 24 teams, having been expanded from the 16-team format that was used from 2004 to 2015. Under this new format, the finalists would contest a group stage consisting of six groups of four teams, followed by a knockout stage of 16 teams. The host nation qualified for the final tournament automatically, while the remaining 23 places were determined among the other 45 national teams of the AFC through a qualifying competition running from 2015 to 2018, part of which also served as part of the 2018 FIFA World Cup qualification process for the confederation. The 2019 AFC Asian Cup qualification was the qualification process organized by the Asian Football Confederation (AFC) to determine the participating teams for the 2019 AFC Asian Cup, the 17th edition of the international men's football championship of Asia. For the first time, the Asian Cup final tournament was contested by 24 teams, having been expanded from the 16-team format that was used from 2004 to 2015.The qualification process involved four rounds, where the first two doubled as the 2018 FIFA World Cup qualification for Asian teams. The 2023 AFC Asian Cup qualification will be the qualification process organized by the Asian Football Confederation (AFC) to determine the participating teams for the 2023 AFC Asian Cup, the 18th edition of the international men's football championship of Asia. Since 2019, the Asian Cup final tournament is contested by 24 teams, having been expanded from the 16-team format that was used from 2004 to 2015.The qualification process involves four rounds, where the first two double as the 2022 FIFA World Cup qualification for Asian teams. Son Heung-min (Hangul: 손흥민; Hanja: 孫興慜; [son.xɯŋ.min]; born 8 July 1992) is a South Korean professional footballer who plays as a winger or a forward for Premier League club Tottenham Hotspur and captains the South Korea national team. Son finished his development at Hamburger SV, where he made his debut in the German Bundesliga in 2010. In 2013, he moved to Bayer Leverkusen for a club record €10 million, and played for the club in the UEFA Europa League and UEFA Champions League. Two years later, he signed for Tottenham for £22 million, becoming the most expensive Asian player in history. While at Tottenham, he became the top Asian goalscorer in Premier League history.A full international since 2010, Son has represented South Korea at the 2014 and 2018 FIFA World Cups and is South Korea's joint highest scorer at the World Cup alongside Park Ji-sung and Ahn Jung-hwan with three goals. He has also represented South Korea at the 2018 Asian Games where the team won gold as well as the 2011, 2015, and 2019 editions of the AFC Asian Cup, finishing runners-up in 2015. 2004: "Fly on the Wings of Love"
2019: "Zanaha Zayed" & "A Sky Full of Stars"
1 Considered a successor team by FIFA, or have competed under other name(s). 2 Israel was a member of the AFC until 1974. 3 Recognized by FIFA as defunct.